Objective RIO — triple gold and a new record. 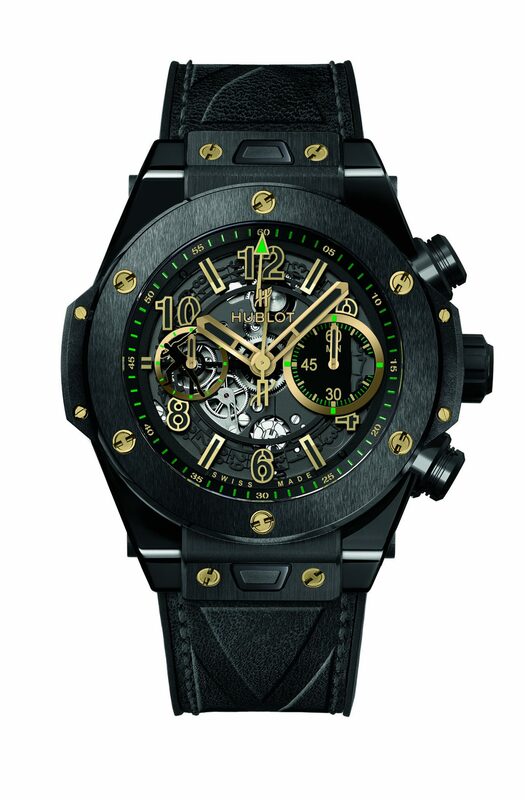 In order to mark 2016, a milestone year for Usain Bolt, Hublot has created two new limited editions imbued with all that embodies the strength, determination and success of the fastest man in the world. Six-time Olympic champion and eleven-time world champion, the record holder is also a champion in terms of the challenges he sets himself. 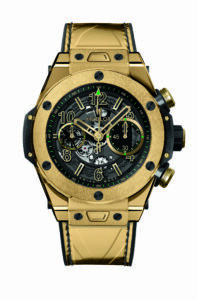 Gold for the Big Bang Unico Usain Bolt—symbolising the champion’s objective—his third triple Olympic gold at Rio. An All Black version in the Jamaican’s lively colours, paying homage to the path of a legend and his pursuit of a new record. Two Big Bang models that perfectly resume the goals that Bolt has set for the Olympic Games in Rio. Since 2010, Hublot has been standing alongside the greatest sprinter of all time and shares the same quest with Bolt. A quest for the precise and perfect measure of time, the desire to stand the test of time and to always surpass oneself and set new challenges. The year 2016 is one focused on figures, symbols and challenges. With the Rio Games in his sights, Bolt has set himself several challenges. Winning the Olympic triple-triple. After Beijing in 2008 and London in 2012, where he won gold for the 100 metres, 200 metres and 4 x 100 metres with the Jamaican relay team, the sprinter is aiming for a hat trick. Already the holder of 3 world records: 100 metres (9.58 seconds), 200 metres (19.19 seconds) and 4 x 100 metres (36.84 seconds), he has also stated his goal of breaking the 19 second barrier for the 200 metres. The Jamaican will turn 30 on the day of the games’ closing ceremony. Synchronicity or pure coincidence, only time will tell, but Bolt has already become legendary. The 3 medals he won during 2015 Beijing World Champion already gave him the status of the most brilliant athlete in history and the only one to have achieved a gold triple-triple.